I've officially been living in New York for a year-and-a-half. That calls for a contest. 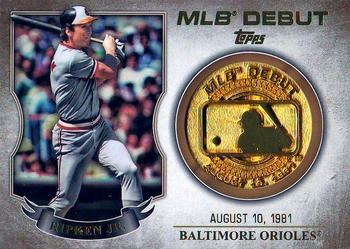 This contest is for a 2016 Topps Baseball S1 Cal Ripken Jr. MLB Debut Medallion. Contest ends 4/3/19 at 9:00pm EST. The rules will be explained below. Good luck! To enter this contest, simply leave a comment on this post. You can enter once per day until the contest ends. The winner will be selected using Random.org, and will be notified via email. The winner will have one week to send me their mailing address. I will ship the card (along with some other goodies) to the winner for free. I already have the card, so leave me out of the contest. Congrats on surviving a year and half in NY. I wouldn't. Hell my heat stays on now at 80 year round. Nice a year and half in NY I was there for a few days and couldn't get out fast enough. lol I'm in I need Cal. Very nice card, thanks for the contest! Saturday entry, thanks for the contest! Well I'll throw my name in! Toss my name in the hat too! Where are all of the Jeopardy cards? Why Was He Dressed As Hitler? Logo by r/RyanJovian. Simple theme. Powered by Blogger.